I’m often confronted with the statement, “But it’s not scientific to believe in God!” usually followed by a flurry of incorrect statements about the position of scripture on certain topics, such as that the earth is the centre of the universe. These straw man arguments are, of course, easily exposed because they generally either misrepresent what is written in the scriptures (e.g. there is no verse in scripture that can be used to infer that the earth is the centre of the universe, this was a misguided doctrine of the Catholic church), misinterpret what was written (e.g. it’s obvious, in most cases, when metaphorical language is being used in scripture) or misunderstand the basic tenets of the Christian worldview. To understand why some people claim that the Christian faith is incompatible with science (btw. I’m not claiming that all faiths are compatible with science! ), we need to briefly take a tour back into history: The 1800’s were characterised by the industrial revolution and rapid development in all of the sciences. As you may know, the theory of evolution was developed in the 1850’s by Charles Darwin and it was his book, “The Origin of Species”, that caused many people to question whether God was indeed the creator of life on Earth and thus whether the Bible could be trusted from a scientific point of view. This led to a blanket tar-brushing of Christianity as “unscientific”, largely because of a caricaturisation of the biblical account of creation (yet another straw man). The new “scientific” worldview of the day assured people that they had gained a superior insight to the ancients, who in their ignorance and superstition were quick to ascribe everything they could not understand to “God”. Ho hum, if only it was as simple as that. Firstly, it’s a false assumption that faith and science are automatically at odds. This is only true if you misrepresent Christian faith as blind and unthinking, neither of which can be inferred as characteristics from a plain reading of the Bible. In fact, scripture gives us clear injunctions to engage God with our minds: “Come now, let us reason together, says the Lord” (Isaiah 1:18) “My people are destroyed for lack of knowledge.” (Hosea 4:6) “You shall love the Lord your God with all your heart, with all your soul, and with all your mind” (Matt 22:37). Secondly, a few important facts are conveniently ignored when presenting the “faith is unscientific” argument: Copernicus, Galileo (yes, the same guy who was hauled in front of the Inquisition), Newton, Faraday, Pasteur, Rutherford and Planck, just to name a few, were all Bible-believing Christians and collectively they have delivered to us most of the A – Z of our modern understanding of the physical world, including concepts such as electricity, gravity and nuclear physics. This list doesn’t include the “deists” (those who believe in some form of deity, not necessarily the God of the Bible), where the list most notably includes Albert Einstein, who delivered to us the general theory of relativity, which provides us with a more detailed and vastly improved understanding of our universe. All of the discoveries these men (and women) made were not only eminently scientific, but also crucial to enhancing our understanding of God and the faith that we as Christians exercise – as I will explain a little later. What is important to note here is that all of these discoveries came after Darwin published his theory and, rather ironically, they actually contribute to reinforcing a biblical worldview by delivering to us a more complete understanding of some of the events in scripture which had just been discarded as “unscientific” by the Darwinists. In other words, it is often people’s own lack of knowledge/understanding of certain scientific discoveries that prevents them from appreciating God’s presence in Creation. I would like to make use of this space to provide a high level overview of some key concepts in physics that will help illuminate our understanding of scripture, and hopefully of God too. I’ve limited myself to the realm of physics, because I studied physics and associated subjects for four years whilst completing my mechanical engineering degree. Similar arguments can be presented in the realm of geology, biology and chemistry, but I’ll refrain from speaking about things that I know little of and stick to a subject matter where I at least have some expertise. However, there are equally compelling arguments to be made in all of these disciplines and I would encourage you to read more broadly before blindly believing assertions like “modern micro-biology proves evolution” (when it actually points in the opposite direction in most cases, to use but one example). To start, I’d like to make the bold statement that there are no supernatural events recounted in scripture that contradict what we know to be possible (or more specifically cannot be explained) through the application of quantum mechanics, the general theory of relativity and a basic understanding of higher dimensions (a good grasp of mathematics won’t harm either). I am referring here to the “strange” events recorded in scripture, for example, the creation of the world, the day the sun “stood still” in the book of Joshua, the miracles of Christ and, most notably, the resurrection of Christ from the dead and his subsequent ascension. I’m not going to attempt to go into detailed background and context on each of these points here because, quite frankly, I don’t have the time to write it and you don’t have the time to read it, so if you want to know more I will leave the responsibility to self-educate to you. Point is, I’ve picked the “hardest” examples to “explain away” so that we can examine each one critically in the light of what we know about modern physics (and by the way, far stranger things are happening in our world today than the mere appearance of angels). Einstein’s formula defines how small amounts of matter can be converted into vast amounts of energy (that’s where we get nuclear bombs and nuclear power from) – but the opposite is also true i.e. energy can be converted into matter. God is infinite energy and He exists outside the bounds of space-time (in the 5th dimension and higher, which we’ll still get to). For Him to create the universe in a “big bang” moment, simply required the conversion of some of His infinite energy into the mass that is the universe today. There’s an excellent IMAX movie about the Hubble telescope that brings this into context – simultaneously terrifying, beautiful and awe-inspiring. Interestingly, all of the concepts we associate with the modern physical universe are found in the first few verses of the book of Genesis and even the order is correct: First God, created the dimension of time [“the beginning”] and then he created the dimensions needed to accommodate the physical [“the earth”] and what I’ll call the meta-physical universe [“the heavens”], in other words, the dimensions of space [“the heavens and the earth”]. Put together, this gives us the multi-dimensional space-time continuum in the first sentence of Genesis. As an aside, and this is just my opinion, I think that perhaps in the first few verses the use of “earth” references the three dimensions of space rather than the physical earth and “heavens” references the 5th dimension and higher. I infer this from the description that it (the “earth”) was initially without form and void and that it was in darkness i.e. it wasn’t a physical form yet, but rather a “space”. Perhaps the “waters” referred to are an abstraction of the “waves” of gravity that came into existence with the creation of space (or other wave properties on the electromagnetic spectrum?). “So the sun stood still in the midst of heaven, and did not hasten to go down for about a whole day. And there has been no day like that, before it or after it, that the Lord heeded the voice of a man; for the Lord fought for Israel.” (Joshua 10:13 – 14). This is an oft-presented argument against the rationality of scripture, but once we are aware of the concept of relative time, then it is no longer a problem to explain. Amongst the things that Einstein theorised with special relativity (and which was later proven through experimentation) is that time is relative to the speed at which the observer is travelling; there exists also a relationship between time and the force of gravity – clocks that are far from massive bodies run faster, and clocks close to massive bodies run slower (this is know as gravitational time dilation). In other words, in order for an event such as this to take place, it would either have required God to “stop” the sun (i.e the earth from spinning), which some have rightly pointed out would be absurd or God could simply have “plucked” a “string” of gravity (the movie Interstellar does a great job of depicting this) to disrupt the gravitational field at that point in “space” and thus caused a gravitational distortion/anomaly that caused a dilation of time from the perspective of the observers. Think of it like a time vortex – it just “sucked” time in for as long as the vortex existed and the moment it had subsided (i.e. the string had stopped vibrating), its effect disappeared. This means that while the earth continued its course and perhaps 12 hours of daylight were experienced by those outside of the time vortex, those inside the vortex would have experienced the “daylight time” as perhaps being 24 hours long. Yes, the observers inside the time vortex would have experienced a change in gravity and quite frankly the maths is beyond the scope of this post (and possibly beyond me!) but the point is the biblical statement is not ridiculous, unfounded or unscientific, based on what we know today. In order to understand the miracles of Christ better, we need to have a grasp of the multiple dimensions that exist “above” the four dimensions of space-time that we inhabit (referring back to the higher dimensions of “the heavens” that I alluded to earlier). God is a higher-dimensional being (just how many I do not know, but arguments could be easily be made for anywhere between five to seven dimensions from scripture, but there’s a good possibility that God is not limited to even this, but inhabits as many dimensions as He wills or needs – possibly even an infinite number). Because it’s hard for us to comprehend what a higher dimension might be like conceptionally, we need to use a process that I’ll just call “reduction” to gain a better grasp. In order to do so, we can use an analogy of a world, called “Flatworld”, which is a two, instead of three, dimensional world. In other words, think of Flatworld like a piece of paper and the people that live there are two dimensional i.e. they only have width and length, but no height. They can also only move in two dimensions i.e. the concept of “flight” is alien to them because it would require them to traverse into a higher (third) dimension that they cannot “access” due to the limited technology that they have which does not allow them to escape their two dimensional world. Time in Flatworld can be represented by a third dimension as additional sheets of paper – each one representing a moment in time and stacked on top of each other as time progresses. Think of it like the flipping pages of the running stick man booklets we all created when we were children (which is how cartoons were made before the advent of digitisation and where the concept of a “motion picture” originated, but I digress). Each page represents a moment in time that changes slightly from one moment to the next as the people of Flatworld move through time. Now we, as three dimensional beings, can pretend to be the “gods” of Flatworld. We can observe Flatworld from “above” and see everything that is going on there because of the “power” of the third and fourth dimension that we inhabit simply because of our state of being. Because we are looking down from “above” we can see into homes in Flatworld, as much as we can see into the hearts of the people of Flatworld because walls and bodies are not a “barrier” to us. Similarly, we can pull out individual sheets of paper, representing moments in time, past, present and future for the people of Flatworld, and observe all of these as if they happened at the same time by spreading them out on a table. In other words, we can see their future and their past, much like God can observe our future and past – simultaneously. I’ve depicted these concepts graphically below to help with understanding this concept. At top left we have Mr. Flat and his square house with a door at the front (viewed from above). As you can see, Mr. Flat needs to move through the door of his house to gain entrance (obviously). However, I, as the “god” of Flatworld, can just look into his house from above and move over the walls with ease by making use of the third dimension of space that I have access to i.e. I can step “over” the line that represents a wall (really, I can just glide right over/through it because it is, after all, flat with no height at all). If I wanted to “appear” in Flatworld at any point, I could just poke my finger through the “page”, as represented by the cylinder in the diagram – this action would “punch” a hole into Flatworld’s space fabric. For an observer in Flatworld, my finger has just “magically” materialised out of nowhere in the middle of Mr. Flat’s house. Note that from the perspective of Mr. Flat in his 2D Flatworld, my 3D finger would just appear as a line (when viewed from the side – it would actually be a circle/ellipse that Mr. Flat could walk around and touch the outside edges of). I could appear and disappear from Flatworld at will, with little more than the prod of a finger. To the observers in Flatworld, this appears as a miracle, but to me it is a simple mechanism leveraging a higher dimension that would allow me to do other incredible things in Flatworld, such as walking on water etc. I’m sure you get the point by now. You can extend this analogy to all the miracles of Christ and understand how “easy” it was for Him to perform them, simply by leveraging the laws of physics in the higher dimensions. Since Christ is God, He is not limited to the three dimensions of our world but can leverage the higher dimensions that he has access to, to perform what we would term “miracles” in our 3D world. Taking this further, we can see how God is not limited in his view of us by just seeing the “outside” of our bodies. He is able to see the “inside” too – spirit and mind. At bottom left we have a zoomed in view of Mr Flat, also seen from above. 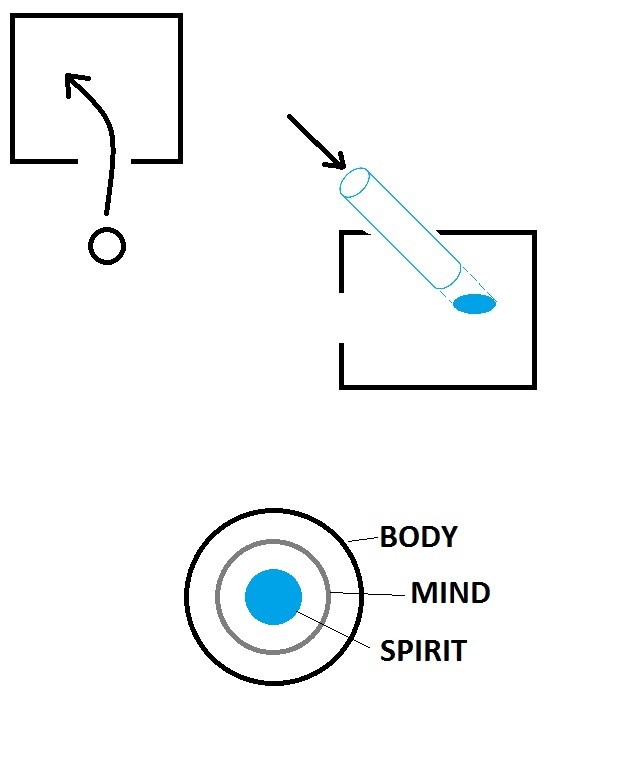 Just as we can observe what is going on inside his spirit and mind, God can observe our thoughts and feelings just like we’d look at a cell under a microscope and observe its internal biology. It gives new meaning to the scripture: “the Lord searches all hearts and understands all the intent of the thoughts.” (1 Chronicles 28:9) In the same way, if our bodies are afflicted by sickness or disease, these are observable to God and He can, in response to a prayer of faith, reach out and remove the cause of the affliction from the “inside” without needing to surgically pierce the “outside”. Remember that we need to extrapolate two dimensional Flatworld into our three dimensional world to understand how this would work, so you need to resist the temptation of seeing the depiction of Mr. Flat’s inner being as equivalent to a cross section through the human head because that is not going to reveal the mind or spirit – we would need to see this from the perspective of the fifth and higher dimension. The point I am making is that God, who inhabits the higher dimensions and can easily condescend to our lower dimensions can heal not only physical diseases in our realm, but also emotional and mental pain. It brings home the reality that when Christ came, He could go “about all the cities and villages, teaching in their synagogues, preaching the gospel of the kingdom, and healing every sickness and every disease among the people.” (Matt 9:35).